In the words of the great Leonard Bernstein, ‘I feel PRETTY and WITTY and GRAAAAAY!’. Okay, so maybe it was gay, not gray, but either way, I’m feeling pretty AND witty today, so I thought it would be a great time to do some more deep-diving into the world of gray. Other than white, gray is hands-down, one of the HARDEST paint colours to choose (to which many of you might say that ANY paint colour is hard to choose), but seriously, gray is a bugger. So, why is gray such a pita (pain in the…)? Because it is a chameleon. Because no matter WHICH gray you choose, it will shift itself on a wall-to-wall basis. Because JUST when you think you’ve landed on THE gray of your dreams, it goes and changes colour. And speaking of colour, let’s talk about the undertones of gray. Your PERCEPTION. While the colour itself is NOT subjective (it is what it is), how it is SEEN can vary from person to person! What to do, what to do. Drink. That is a personal instruction, not one directed at you, although it’s not a bad idea if you’re struggling with gray paint colours. Now I’ve gone into MUCH more detail in this blog post: Gray Paint Colours – The 3 Undertones You Have to Consider, so I’m not going to hit that much harder. What we’re going to do now is look at some examples. Why? Because they will give you visual support to let you know that you AREN’T going crazy – it’s the gray that is crazy and I’ve got 3 great examples to show you why (and I’m not even going to get STARTED on SW Repose Gray which is the craziest of them all). 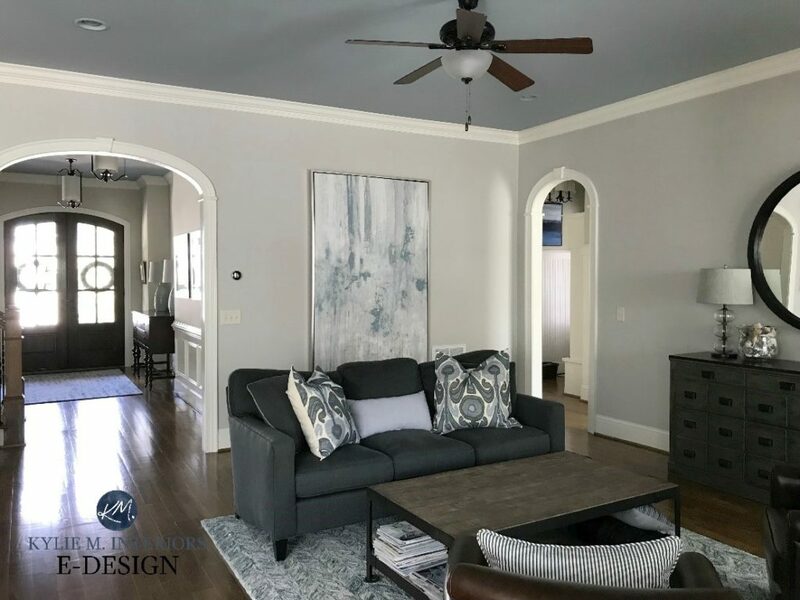 Recently, I had an E-design client hire me because she’d chosen Benjamin Moore Shoreline for her living room, but didn’t like how it was flashing a bit purple. Oh, a bit purple…and everything else, but it’s a GREAT example of gray and it’s (ahem) ‘flexibility’ (said slowly and painfully using air quotes). Like many grays, Shoreline LOOKS like a nice soft gray. However, it has a whole whack (technical term) of undertones to contend with, undertones that are ENCOURAGED by the environment. You might even think that those walls are 3 different colours, but they are ALL Shoreline! Shown above, you can see that it looks like a light gray with a slightly fresh, cool blue look to it. Below, we have Gray Owl again, but it’s looking a weee bit moodier and is picking up a hint of green-blue to it. You might not even SEE this until you compare it to the fresh crisp look of Gray Owl above. So of course, if you picked Gray Owl based on the FIRST image, you would be greatly disappointed if it turned out like the bottom photo…and it just might. Again, it all comes down to the MULTITUDE of factors that we discussed earlier, and short of stopping the earth from turning (I started out by saying we should stop the sun from moving), there is no way to avoid the ever-changing nature of gray. Revere Pewter is ALWAYS surprising. Okay, I’d say that 80% of the time it’s predictable and 25% of the time it’s surprising. Still pretty, but definitely not muddy or tinged with green. And if you like a gray with a blue undertone this is okay, but if you DON’T it will be a problem. And if it doesn’t go green and it doesn’t go blue, what does it do? It goes slightly purple WITH a wink o’ green. Lord have mercy. So, now that we’ve looked at some examples, let’s touch on some helpful tips to pull the frayed edges of our sanity together. Why be kind? Because no matter how much you wish, there is NO paint colour and NO gray that will look the same on every wall. As I’ve shown you above, it will flex itself more than a 10 year old gymnast. The key is to find one that you ‘generally like on every wall’ while trying to avoid the specific undertones that you don’t like. When you do a paint sample, be sure to sample it the right way. Paint up a nice big sample (on a canvas/posterboard) and either leave a white border around it or put it on white paper. If you don’t seperate your OLD wall colour from your NEW wall colour, the old one will 100% skew your perception of the new one. Trust the Ginger. Red or white, red or white. MIX THEM BOTH AND GET ROSE, YAY! (I will squeeze wine references in wherever I can). As for gray, it will have undertones of either blue, green or purple. You might not like any of them, but I bet there’s one that you like more and one that you like less…and one in the middle. If you don’t like ANY of those undertones, you need to stay away from gray! Choose the undertones that you absolutely can/can’t live with. This doesn’t mean that it won’t hit a WINK of the fugly one on the odd wall, but it does mean that you can focus your efforts on grays that are more likely to hit yer happy place. 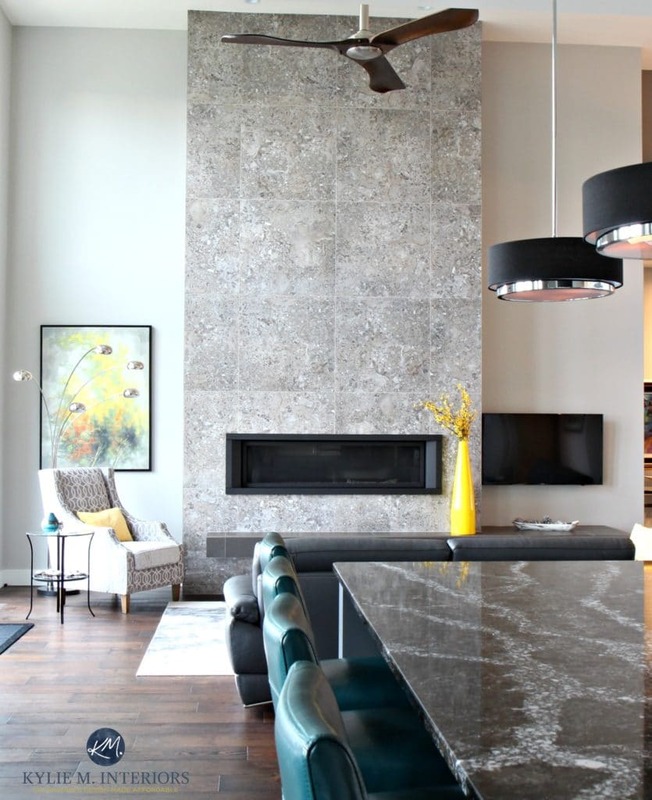 Most people are picking gray because their home already has some type of gray in it. And THAT gray will have an undertone. You will want your paint colour to have the same undertone or one that coordinates pretty damn well. If you don’t HAVE anything with gray in it (ie: you just have wood flooring), you can go back to your personal preferences, taking into consideration your EXPOSURE and lighting situation. If you are transitioning from beige, you might want to read this blog post as you can’t just jump in swingin’! 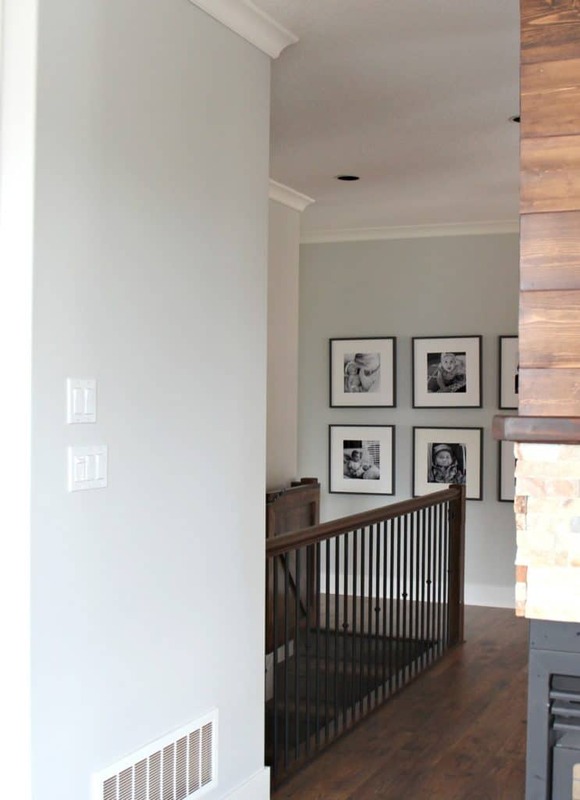 Benjamin Moore Stonington Gray: Gray with a blue undertone that might swing the TINIEST bit green. 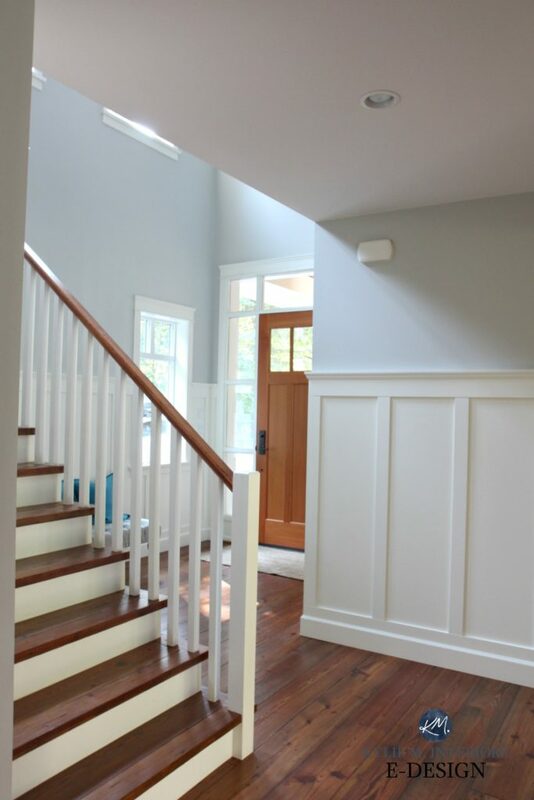 Sherwin Williams Big Chill: Gray with a very soft blue undertone. Sherwin Williams Repose Gray: I couldn’t just leave you hanging with this one. Repose Gray is one of the HARDEST grays to nail down, and I talk all about it here. Not sure which gray is best for YOU and your room? Check out my affordable E-design & Online Paint Color Consulting packages! Hiya Toni! You are the 2nd one to ask that! That is SW Ellie Gray with SW Big Chill. Ellie Gray can sometimes swing a weee (like super wee) wink blue-green! I used SW Zircon in a hallway, stairwell, bathroom and bedroom and like it in all lighting. It’s fresh looking. Thank you for letting us know Janu, it’s comments like these that help other readers explore new colours! The last comment was about Knitting Needles, which is quite similar with it’s SUPER passive purple undertone! I love the dark gray on the page you displayed that says “start painting stop guessing “. What color is that wall? It’s very rich looking. I really enjoy reading your articles. They are informative as well as being entertaining! You were very witty! Well, thank you Kelly! And yes, I have used Knitting Needles, it’s GORGEOUS (I just referred it to an E-design client today too!). And while it might look pretty darned gray to you, it does flex a bit into purple (just so you know ;). YOu might not even see it until you compare it to say, a gray-green or blue-green! very informative info about grays. I have revere pewter and it does seem to look good with everything….I would like something fresher, but I just can’t stand the purple, blue, pink, or strong green undertones. Could you do a video on the Sherwin Williams paint color “On the Rocks” ? I’m really interested to hear how you would review it. Thank you! So what you are saying is that there are basically 50 shades of gray or is it grey? 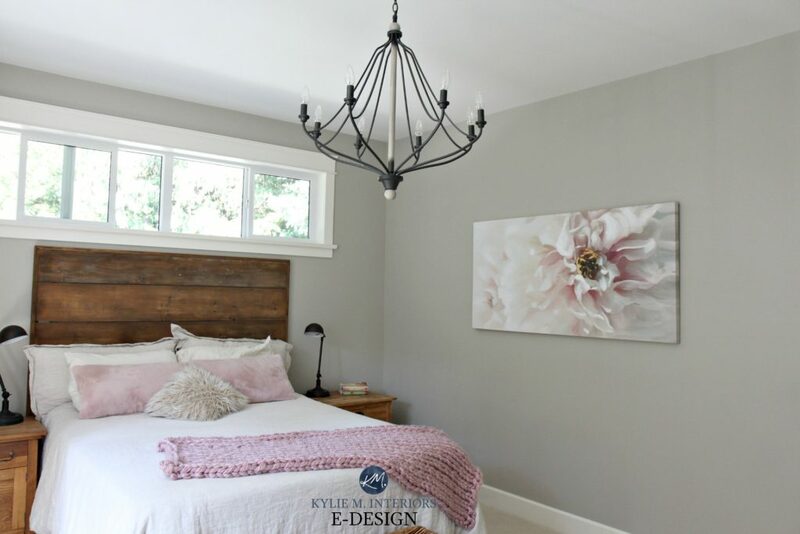 I love your blog it’s not only entertaining but very educational!I have a question for you Kylie, So if you had let say stonington gray and you wanted to transition into a more neutral color down the hall or adjacent room without having to paint over stonington,…what would be your choice? What is your go to neutral, what would compliment stonington without clashing with it? Would love to know your thoughts on your choice of neutrals, would it be gray, or not? Ooo, to complement it, but get out of gray, I almost think you’d want to go to a warm off-white, slightly creamy, something like BM White Down, but the warmth of it will pop a bit more off of Stonington. And while it’s not entirely ‘warm’, I do like Classic Gray which is a slightly warm gray :), a bit of a transition perhaps. I chose Collingwood for my southwest bedroom after failing with Anew Gray(too much green). MOST times of the day I’m happy with my choice but certain hours I still get a hint of green. Based on your blog, I attribute this to lots of green outside my window from our yard and open space behind us. I wish I’d gone a tad darker because of the light in the room. Kylie, your blog has been tremendously helpful! Thank you. Thanks for the drinking advice – that has been the most helpful tip during this process. I’m currently reading this posting (again) while sipping Rose. We are moving to a (mostly) North facing apartment in NYC with good windows. The other exposures are East and face a brick townhouse wall (aaaah, NYC). The whole apartment is currently painted Super White which is a little too stark for our tastes but we may just give up and use that! Yes, the bedroom looks pink in the morning. The living dining, foyer are one big room. The kitchen and bath are grey and white. We thought – easy-peasey we currently have Revere Pewter and love it in our south facing apt. WRONG – looked terrible. So tried foam boards with all the grays in your blog – Balboa (purple) , Edgecomb and Classic Gray (too beige), paper white (too blue), Gray Owl (too blue). We finally found BM Light Pewter, but I can’t find it reviewed anywhere to understand their possible undertones. They actually seems like a lighter, slightly grayer version of Revere Pewter , and we found Rodeo which seems like a lighter RP. Have you ever seen anyone use BM Light Pewter (or Rodeo)? I don’t like grey AT ALL in any way, shape, form or hue (green-grey, purple-grey, its all screams grey to me). Grey just looks depressing. I’ve had several design “consults” with color experts and they all recommended grey hues – even when I told them I “hate” grey in any form. Unfortunately, I listened to them and now hate my living room – but I’m selling soon so it will look “trendy” by golly! It seems to me most designers/color experts have their “stock-trendy colors” and recommend them. I’m hoping that the “grey-trend” will end in 2020 (it started in 2010, at least on the US “coasts” which are quick to embrace the latest trend), having outlived it’s 10 year “run”. At any rate to each his own. I found the post interesting from the perspective of how light influences colors – even grey. I’ve learned a lot about color undertones and light from this blog (thanks Kylie!) and can’t wait to pick out colors in my new place. Oh Joyce, you know, you aren’t the only one! I’ve had a lot of demand lately for the warmer end of things and I think things are slowly swinging around. I don’t know that we’ll hit full-blown beige anytime soon (with regard to neutrals), but things they are a changin’! We recently used Gray Owl for a client/friend (I helped raise him, now I get to help him decorate as we’ve both moved to another state – how fun!). Gray Owl definitely went greener, which works as he has a green leather sectional and a green-grey brick fireplace. However, it got darker than we wanted in the areas that don’t have a lot of natural light. Hi Kylie! I a recently discovered your blog, and I love it! After four years in our home, we are finally getting around to redoing our laundry/mudroom. Hooray! My husband is doing all the work–all I have to do is pick the paint color. We chose pretty gray cabinets (to replace the old brown ones) and the floor is a lovely whitish gray faux-wood. Washer and dryer are white. It’s a north-facing room with a ton of sunlight from the one big window. I wanted to do a blue (my favorite color, and yet I have no blue paint anywhere in our house), but we worried about going too dark. So we finally chose Stonington Gray, based on some of your reviews. While I love the color, I think it’s too similar to the cabinet color. So should we go light, like maybe Silver Satin or an off-white (which seems boring to me) or pick a different color altogether? We put up some Revere Pewter (along with Gray Owl and several other blue/grays) but I’m just not sure with the gray cabinets. Any thoughts? Thank you! !